5 February 2010, at 6:38a.m. 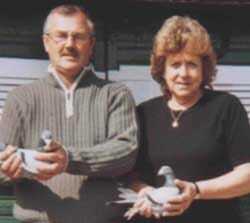 UK - Peter Hagland has another amazing season with Orego-Stim Pigeon Liquid. Peter has been using Orego-Stim Pigeon Liquid for over four years now and says: "I swear by Orego-Stim to be honest. I'd seen it advertised so when I went for my corn one day, I thought I'd give it go and I've been using it ever since." Orego-Stim will be available from Clare's Pet Products, B. Leefe & Sons and P.J. Lofts at the Blackpool Show 2010. For more information, please visit our web site [click here].